Additionally, CurveEQ implements spectrum matching technology that allows you to transfer spectrum's shape of one recording to another. In other words, this allows you to "copy" frequency balance of existing time-proven mixes so that other mixes that are still in the works may have a chance to sound better. This technology also greatly helps in music mastering since it easily lessens any dramatic differences in the area of frequency balance between various tracks. CurveEQ's filters can be switched between linear- and minimum-phase modes. 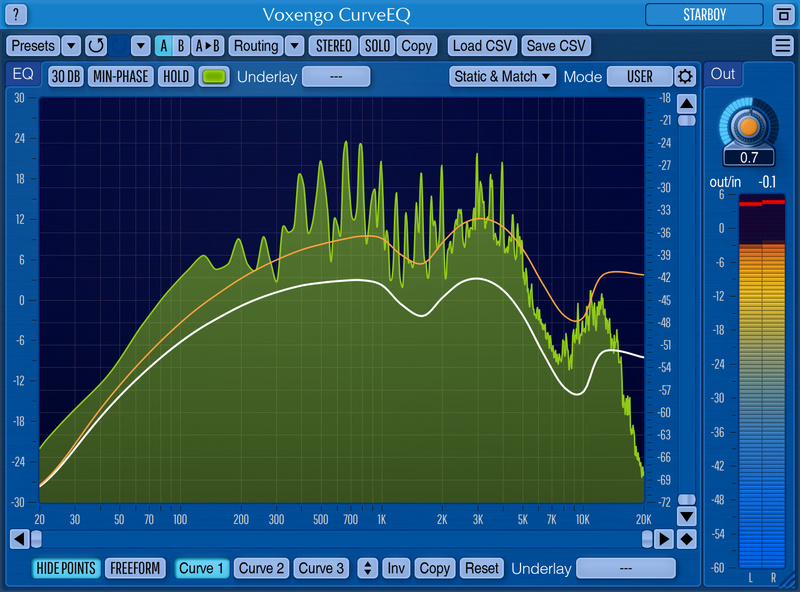 CurveEQ also features a deeply-customizable spectrum analyzer like the one found in Voxengo GlissEQ and SPAN plugins. You can also display, save and load static spectrum plots for comparison and matching purposes. equalizer, linear-phase, matching, mastering, spectrum Linear-phase spline equalizer AU and VST plugin. Features high-quality spectrum matching and ultra-clean sound. Ideal for mastering applications.